I was looking at the local Dollar Store for some Lifesavers to give away during the Children's Sermon last Sunday. The reading from the Hebrew Scriptures was Isaiah 45:1-7, where God says two times "I call you by your name." I had planned on saying that I was going to be moving away soon, and that although pastors move on, and life changes, God always stays with us and knows us by name--God is our Lifesaver. As I stood in the aisle looking at the candy possibilities, I remembered a candygram gift my daughter had made for a friend's birthday during middle school. Phrases with candy names began popping into my head. Phrases like "God created the Milky Way" and "you may not be Mike & Ike, but God knows your name." 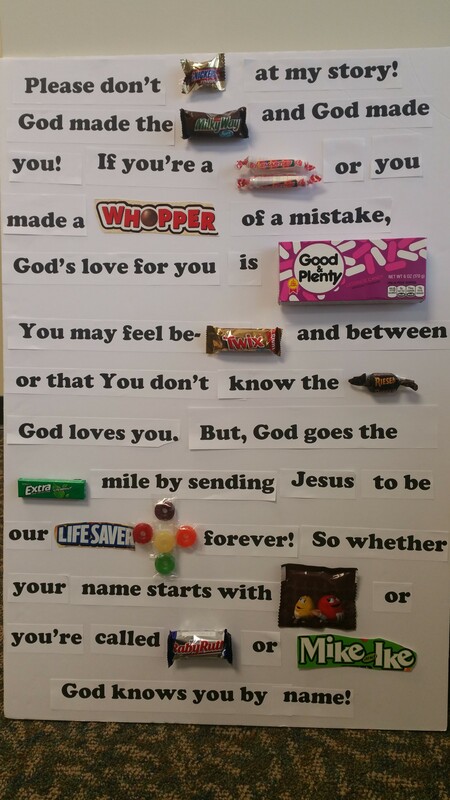 And behold, a candygram Gospel message was born. Here is the good news according to Halloween that became my Children's Sermon--and giving away candy with it certainly increased the number of children who came forward! Please don’t Snicker at my story! God made the Milky Way and God made you! God’s love for you is Good ‘N Plenty! to be our Lifesaver (or LifeSavior!) forever. God knows you by name!